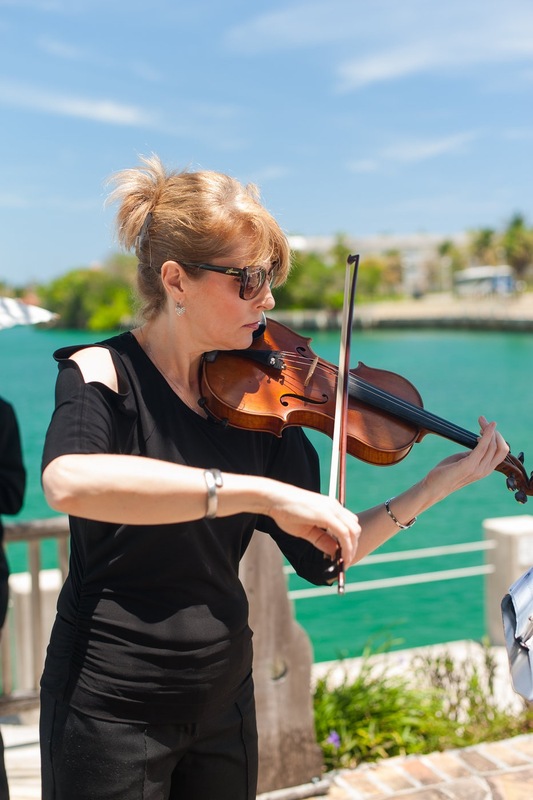 Today we feature our Bahamas wedding music partner – violinist Eva Ratuszynski, a very popular choice by couples for their Wedding ceremony. Born in Tarnow, Poland, Eva started her musical education at the age of six, earning her diplomas in both violin and piano at the Ignacy Paderewski Primary and Secondary Music School. As a young woman, she entered the W. Spasowski Institute of Education and graduated with distinction in Methodology of Music Teaching. She continued her education at the J.Kochanowski Pedagogical University in Kielce, Poland, under the tutorship of Aram Khachaturian’s pupil – Miroslaw Niziurski. There, she received her Bachelor Degree in Music and First Class teaching license. Eva’s career started at a Primary Music School as a violin teacher, and at the Institute of Education as an instructor of Music Teaching Methods. For 11 years, she was first violinist in the Tarnow Philharmonic and Chamber Orchestra concerting in Poland and Eastern Europe, as well as giving master classes to local music schools. She also composed music for two musical productions and worked as choir director in two colleges, wining several competitions on the regional and state level. In 1992, she moved with her family to Montreal, Canada, and opened a violin and piano teaching studio as an external teacher of McGill University. As a member of the Canadian Music Teachers Association, she was the organizer of several recitals and master classes for students. Later on, she took the position of music director and violinist at the Temple Baptist Church in Montreal. In 2003, following her husband, Eva moved to the Bahamas and started to teach piano at the Allegro Music School. Working with Ms Covena Murphy, the school’s owner, they launched a violin program two years later. With a growing number of violin students earning great marks by examiners of the Royal Conservatory in London, in 2008, Eva created the Allegro Strings. This growing ensemble is has successfully performed in several concerts and celebrations, among them: the Gala Concert for the 41st Anniversary of Independence of the Bahamas hosted by Governor General, the Opening Ceremony of the 2010 World Championship Regatta, the Graduation Ceremony at the College of the Bahamas, as well as performances in the Many Moods of Christmas and with Regency Singers. Eva’s vision is to introduce the enduring beauty of violin music to as many children as possible. She continues building the best violin program in the Caribbean in the hopes of creating the first philharmonic orchestra in Grand Bahama. Eva has played for many Bahama Weddings and writes music to suit your taste.